Here you can find various media from the TAPAS project. At Automatica 2014, the consortium demonstrated the research results of TAPAS. 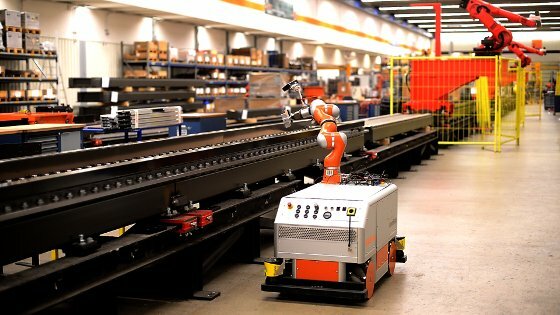 Two mobile robots are working in cooperation in an industrial environment similar to the actual production site at Grundfos in Denmark. The Little Helper assembles rotor cores from rotor shafts and caps and drops them into small load carrier (SLC). After the assembly, the quality of the rotor core parts is inspected. The omniRob delivers subassembly parts from storage to the Little Helper and returns assembled rotor cores. Here, the robot motions are planned autonomously based on information of a previously recorded 2D map and 3D models of the workstations. This picture shows the omniRob performing an inspection of a linear axis. KUKA and CIT carried out an additional evaluation experiment to test the planning algorithms for quality control developed in TAPAS. The experiments were carried out in the KUKA production environment for linear axes in Augsburg, Germany. The inspection of these large parts requires movements, both of the robot arm carrying the camera and the mobile base. The used approach plans optimal positions for the platform and subsequently triggers the image acquisition from various robot poses. This video shows the month 39 experimental evaluation of TAPAS research and technology development at the Grundfos A/S pump production in Denmark. The employed mobile manipulation robots are the Aalborg University Little Helper and the KUKA omniRob. The evaluation covers robot skills, kinesthetic teaching, force control, autonomous navigation, manipulator motion planning, continuous quality control of the assembly process, and mission planning. This video shows the omniRob accurately repeating a user-demonstrated trajectory. Internally, the demonstration is represented using only odometry and raw laser scans. Ground thruth data is shown in the lower left and provided by a motion capture studio with sub-millimeter precision: the reference trajectory from the demonstration is shown in gray, the repetition by the omniRob is depicted in red. This video shows a user test of the human robot interface for skill-based tasklevel programming with the Little Helper. This video shows a part of the month 24-27 demonstration from TAPAS - a collaboration between Aalborg University and Grundfos A/S. The mobile manipulator "Little Helper" carries out complex assembly, machine tending and quality inspection at a real-world industrial production line at Grundfos in Bjerringbro, Denmark. The experiments were conducted over a period of four production days. This video shows how an assembly skill is performed by a human and how such a skilled is mapped to a TAPAS robot. This video shows a long-term evaluation of the fine positioning system at the experimental area of the Autonomous Intelligent Systems Lab in Freiburg. The system is based on sensor data from laser range finders and uses the omnidirectional drive system of the KUKA omniRob to correct for the estimated offset from the goal configuration. In the evaluation, the robot repeatedly travels between three goal locations at which reference scans have been pre-taught. Upon arrival at the goal location the robot corrects its position comparing the current and pre-taught readings of the laser range finders, yielding an average positioning error of less than 0.01 m and 1 deg. This video shows a closeup view of the fine positioning system in operation. For details see the description above. This video shows the assembly of the rotor shaft for a Grundfos SQFlex pump conducted using the KUKA LWR on the Little Helper ++. The task is conducted in a replication of the manual workspace from Grundfos. This task is programmed using a skill-based approach and an intuitive and interactive teaching interface. The task is programmed using 6 different skills. In this task the rotor for a Grundfos SQFlex pump is assembled using the KUKA LWR. This task is today conducted by human operators and the manual assembly sequence is changed slightly to be suitable for the robot. The task is conducted in the same environment as the manual assembly. This task is programmed using a skill-based approach and an intuitive and interactive teaching interface. 10 different skills have been used to program this task. An assistant engineer at Aalborg University has been challenged to program a pick up task using a graphical user interface via an iPad. Prior to programming the task the assistant engineer was given a 10 minute introduction to the KUKA LWR, the gripper, the developed skills, GUI, and the task. The configuration of the task sequence has been done independently by the assistant engineer and he has chosen to use a sequence of 7 skills to complete the task. This video demonstrates how a KUKA lightweight robot can be used to perform various assembly operations involved in assembling a rotor for a water pump. The compliance control of the robot can be used to avoid high forces between the objects when performing tight fits. The work is part of the development of robust generic skills for industrial manipulation tasks. The video has been produced by three master students at the Department of Mechanical and Manufacturing Engineering at Aalborg University, Christian Carøe, Mikkel Hvilshøj and Casper Schou. The video shows our first test using pointing gesture for controlling a robot through teaching by demonstration . The overall goal is to tell the robot to move parts from some storage place and put them into a feeder of some manufacturing system. While the task is pre-programed, the human operator needs to specify which parts, and where they should be filled into to simply by pointing. The demo was done at Aalborg University Copenhagen, Denmark. This video shows a part of the month 6 demonstration from TAPAS - a collaboration between Aalborg University and Grundfos A/S. The mobile manipulator "Little Helper" carries out continuous part feeding at a real-world industrial production line at Grundfos in Bjerringbro, Denmark. The experiments were conducted over a period of three production days. This is a video from the experiments carried out at Grundfos in the first experimental phase.